This paper discusses how efficient a simple dip-lubricated gearbox is in a thermally coupled lubrication model, which includes elastohydrodynamic (EHL) friction losses in gear teeth contacts as well as bearing, seal, and churning losses. The efficiency of drivetrain components is quickly becoming a significant research area pushed by the intensifying quest for improved fuel economy in automotive vehicles. 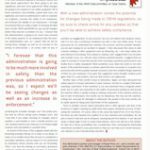 Emission-controlling regulations are becoming stricter, owing mainly to environmental issues, such as air contamination, but also due to the depletion of oil deposits and the resulting high fuel prices. Pursuing augmented efficiency of a drivetrain or its components can also have the positive side effect of decreasing the frictional heat that is generated inside the gearbox, differential, or axle component therefore improving scuffing or pitting behavior. The drive train in passenger cars absorbs around 6 percent of the total fuel energy in combined city- highway driving, which is equivalent to about 30 percent of the mechanical energy delivered to the wheels . The biggest part of this energy loss ends up as heat in the axle or transmission lubricant resulting from friction, windage and churning. 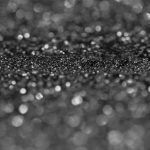 As a result, the reduction of lubricant-related losses in a vehicle’s drivetrain can lead to significant improvements in both the fuel economy and the environmental impact of the vehicle. Thus, this efficiency increase is a much sought-after goal for lubricant suppliers of OEM factory fill and aftermarket lubricants. 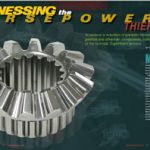 The efficiency of spur gears has started receiving significant attention roughly since the 1980s with the work of Anderson  . 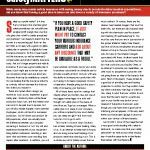 Recent years have seen a boom in such publications, mainly due to the energy crisis. 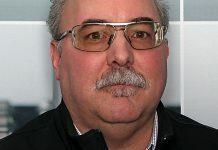 Li and Kahraman  and, more recently, Chang and Jeng  focused on a spur gear pair while Michaelis  considered a more integrated approach that included churning losses as well as bearing and seal losses. Churning losses play a very important role in the prediction of a dip lubricated component’s efficiency and recent studies from Changenet and Velex   have shown that the accurate determination of churning losses and how these are affected by design parameters is a challenging problem. Thermal behavior of the components and thermal response of lubricants are dominant factors of efficiency enhancement. There are several published models of spur gear pairs that analyze the thermal behavior of the pair like those developed by Long and Lord  and Taburdagitan , which use finite element methods to predict the overall temperatures and surface temperatures. 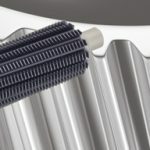 A more integrated approach by Changenet and Velex  considered lump thermal elements to study and model a six-speed gearbox, but with no experimental validation. In addition, the thermal response of transmission lubricants was extensively studied by Olver  who also developed a comprehensive model to predict traction in Elastohydrodynamic (EHL) contacts, which included thermal effects . However, there are currently no efficiency models that consider a full spur gearbox, including the all-important thermal coupling, taking into account the mesh and bulk temperature rise of all drivetrain components or that of the oil surrounding them as well as all sources of energy loss including bearings, seals, churning, and EHL traction. Additionally, the type of lubricant itself is a crucial factor in determining the efficiency of a drivetrain. 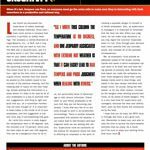 Despite this, there is currently very limited ability to predict the relative fuel economy arising from the use of different drive train lubricants. Petry-Johnson  have included more than one type of lubricant in their studies in an attempt to pinpoint the possible effect that a specific combination of lubricant, component design and operating condition may have on the overall gearbox efficiency. The results from their studies showed a linear relationship between the gear power loss and the rotational speed of the gears. 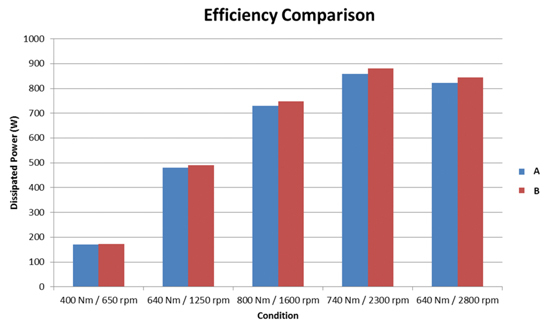 The results also highlighted the effect of surface finish on the efficiency of the gearbox. Their lubricant comparison used three different lubricants to indicate that there is a possible change in overall efficiency depending on the lubricant type. However, no complete method has been developed that is able to simultaneously account for specific lubricant characteristics under EHL contact conditions and relevant gearbox parameters. Such an approach should be able to provide a more accurate estimation of the possible efficiency gain. 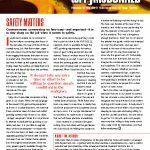 The limitations of current approaches include limited treatment of gear churning losses and not accounting for the transient conditions arising from variable vehicle duty cycle. Kolekar and Olver  have recently worked on this issue concentrating on hypoid axles. A transient thermal model coupled to a quasi-steady state lubricant traction and churning formulation has been used together with lubricant bench tests in order to predict the energy that is dissipated during specified drive cycles. The results highlight the high influence that the properties of axle oils have and that the ranking order of lubricant composition and properties depends greatly on the specified duty cycle, with high viscosity, friction modified oils being favored for high power use. In contrast, lower viscosity fluids than are currently in use provide lower losses for city and light highway duty. In addition to only treating the axle, this work has other significant shortcomings, including the lumped mass axle temperature that does not capture the bulk lubricant temperature, and the lack of a change gearbox model, as well as the lack of provision to determine the effect of drive train efficiency on the engine behavior and therefore on fuel consumption. The present work is designed to offer significant improvements in the accuracy of efficiency predictions for simple spur gearboxes including the effects of lubricant rheology on gearbox efficiency. The model accounts for EHL friction losses in gear teeth contacts, bearing and seal losses, and losses due to oil churning. The EHL friction losses are calculated based on lubricant properties that have been obtained through extensive measurements on a ball-on-disk tribometer, while also fully accounting for the effect of thermal coupling so that any increase in lubricant temperature (and the corresponding change in lubricant properties) due to power losses, is fed back to EHL friction calculations. The ambient temperature of the lubricant in the gearbox is calculated using a multi-physics finite element model which includes all conductive and convective heat transfers within the gearbox. Such a holistic approach, particularly the inclusion of thermal coupling, will enable the model to account for the transient conditions due to particular usage history and therefore predict the efficiency for a given drive-cycle. This section first outlines the basics of the EHL model used to predict tooth frictional losses, followed by the methods to predict bearing, seal, and churning losses. Finally, the FEM approach used to calculate the ambient (oil bath) temperature rise, which is fed back to the EHL model, is outlined. The experimental method used to extract lubricant characteristics that are used as input to the EHL model is also described. A thermally coupled EHL model was devised adopting the approach of Olver and Spikes , which predicts the friction coefficient in the rolling-sliding EHL contact of a lubricated disc pair. hc is central EHL film thickness, m.
Where the non-dimensional parameters are the speed, load (L = line contact) and material parameter respectively. 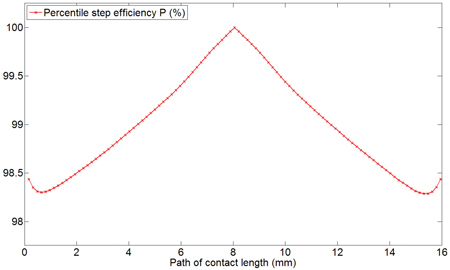 L is length of EHL contact, m.
The mean shear stress is calculated based on the Ree-Eyring approach as adapted by Evans and Johnson , and the traction regime is decided using the following three-stage process described by Olver and Spikes which is based on the non-dimensional Deborah and S numbers (Figure 1). The friction coefficient is then predicted by means of a convergence loop; the loop is initiated by assuming an initial friction coefficient μ0 and then the temperature rise due to shear heating of the lubricant (ΔToil)av and contact of asperities (ΔTf)av are calculated using the approach developed by Olver . koil is thermal conductivity of the oil, W/m-K. Using these temperatures in conjunction with the skin (boundary) temperature rise, TB, calculated using a heat partition αh between the two surfaces, the mean film temperature, T¯ , can be calculated. M is steady state thermal resistance of contacting body. The temperatures are repeatedly evaluated until the desired convergence is achieved (usually within 0.1 ºC or less). 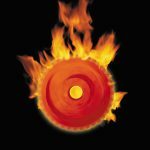 Once these are known, the dissipated power in the form of heat can be calculated by simply multiplying the load with the friction coefficient and the sliding speed. The EHL model assumes that the basic lubricant properties do not change within the contact and are calculated either in respect to the inlet conditions or to the mean film temperature based on the assumption by Evans . The lubricant properties that are used are based on a synthetic 75W90 type gear lubricant and they are calculated using a linear approach for the variation of density and pressure viscosity coefficient with temperature. The shear modulus is calculated using an exponential approach quoted by Muraki . The ASTM equation based on the ASTM D341-722 standard is used to calculate the low shear rate viscosity of the lubricant, based on measurements at 40 ºC and 100 ºC. The model can successfully predict the traction regime and friction coefficient of a combination of materials and lubricants. Roughness of the surfaces is also taken into account by means of the non- dimensional lambda (λ) value that necessitates the use of a boundary modified friction coefficient of the form shown below, suggested by Smeeth and Spikes  for m = 2.
μb is boundary friction coefficient. The model converges in less than 5 iterations for all but the most extreme conditions and can be used as a base to simulate a lubricated gear pair. The basic algorithm described here is summarized in the flowchart of Figure 2. The rheological characteristics of the lubricant play a crucial role in determining the thermal and frictional behavior. Previous studies  have shown that EHL contacts can operate at temperatures that are significantly higher than the ambient oil bath temperature. Therefore, it is necessary to produce an extended lubricant rheology database which will include the typically high temperatures that are encountered in practice. The atmospheric slope index, So , is calculated using the Roelands chart  (p. 58) and the reference low shear rate viscosity at two (2) temperatures. The measured values of ηr are listed in Table 1. 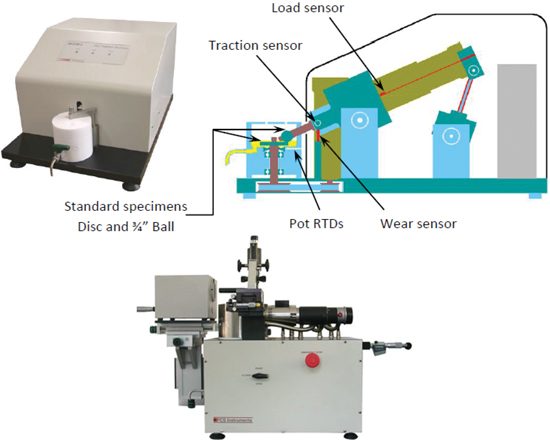 In order to extract the required coefficients for Roelands equation, bench tests were carried out using an MTM ball-on-disc test rig to measure the friction and an EHD rig to measure the film thickness of the lubricant under varying loads and temperatures. The former uses a steel ball pressed against a steel disc to measure the traction coefficients under given conditions while the latter uses the optical interferometry technique to measure the film thickness of the lubricant through a transparent glass disc. The two rigs are shown in Figure 3. The rheology coefficients namely the Eyring stress, τE ,and the Roelands parameter, ΖR ,were then derived from the measured data using an approach similar to that outlined by LaFountain . This involves fitting the Eyring model to the measured traction curves obtained from the MTM tests and then extracting the coefficients once the appropriate fit is achieved. The coefficients were then incorporated into the EHD traction model to improve the accuracy of the calculations. The lubricants modelled here are both fully synthetic 75W90 gear oils and are believed to be of similar composition but they come from different manufacturers. 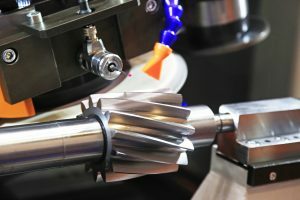 With the rheology adequately modelled, the next step of the process involves designing a spur gear pair for the required transmitted torque, desired life, and reliability. 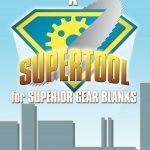 The gear design procedure that is used is compliant with the British Gear Association and in accordance with international design standards . 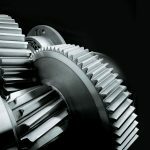 The gears and the bearings were designed for 12 months of continuous operation which is equivalent to around 9000 hours. For simplicity, a 1:1 gear ratio was chosen. After the rough design process is complete and the basic parameters of the gear pair are defined, the geometrical parameters of the pair can be calculated according to appropriate standards . The basic specifications of the selected gears are shown in Table 2. 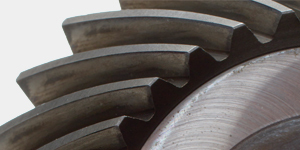 The gears that comprise the gear pair are identical and are similar to the 23T gears mentioned in Petry-Johnson . The full model covers the geometry of spur and helical gears. However, in the presented study, only spur gears have been considered. The load profile and the resulting pressure distribution of the gear pair are shown in Figure 4. Note that the contact pressure for this application is in the high end for a gear region at almost 2 GPa and that the slide roll ratio varies drastically along the path of contact and is zero at the pitch point. With the geometrical parameters defined, the EHL friction model can be applied to the gear mesh to predict the coefficient of friction and the thermal parameters during the variable conditions of a gear cycle. 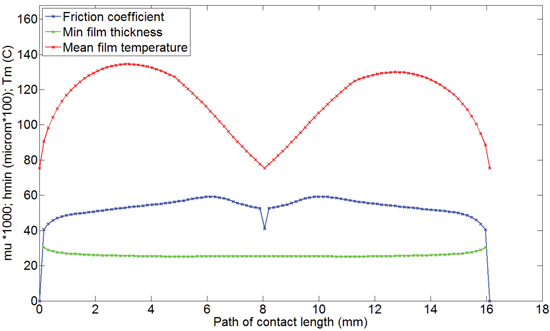 The current tooth mesh cycle was used as a basis for the development of the model, and, in each point of the line of contact, a sub-routine was applied to calculate the converging friction coefficient and the resulting temperature rise inside the contact (mean film temperature). 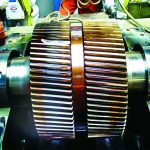 As the roughness of the gears has also been taken into account, a boundary friction coefficient of 0.11 was assumed in order to also consider the boundary/mixed lubrication regime. The inputs that have been used for the design and calculation of the gearbox are roughly based on a 2013 Dodge Ram 3500 Semi Truck and are shown in Table 3. The remaining losses in a gearbox are those due to bearing and seal friction and the churning of the oil. Churning losses are the largest of these, and they are calculated using the set of equations developed by Changenet and Velex . Once the churning torque is calculated, the churning losses are predicted using the rotational speed of the gears. A linear interpolation between the two formulae is used when 6000 < Rec < 9000. The calculation of the churning torque necessitates the definition of a gearbox casing, where the hypothetical gear pair will operate. This is essential so that the oil level inside the gearbox and the oil volume that is being displaced by the gears can be calculated and taken into account. 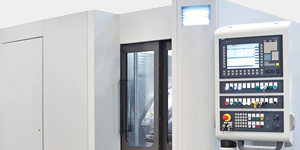 Therefore, an arbitrary gearbox casing was defined and based on proper clearances between the gears and the casing. Using Changenet  as a guide, the value of 2 mn has been chosen for the radial clearance and 1.5 mn for the axial clearance where mn is the normal module of the gear. Once the casing is defined, the gearbox churning losses can be modelled. Although adequate clearances were defined, it should be noted that in terms of size and shape the casing defined here differs from that normally used in the automotive applications. This is inevitable as the current gearbox consists of a single stage only, although the transmitted torque is representative of automotive applications. Bearing and seal losses were calculated using the SKF bearing calculator tools  by considering the selected bearing type and then calculating the seal losses from the difference in losses between the plain and the sealed bearings of the same type. Bearing selection is an important design parameter in a gearbox. A common design procedure selects the bearings for each axle based on the maximum load of the most heavily loaded axle. Keeping in mind that the various axles in a gearbox (two in the current simple single stage application) rotate at drastically different speeds, it is obvious that such an approach will lead to one of the bearings to be over-designed and that the system would be less efficient as a result. Therefore, in order to improve the efficiency of the system, ideally one should apply a procedure that considers each component of the drivetrain individually to ensure that while every component has the same operational life expectancy, there are no over-designed components. For simplicity, in this particular application, a 1:1 ratio was chosen and, therefore, there is no need to design the bearings individually. To account for ambient temperature rise and incorporate thermal coupling into the presented efficiency model, the gearbox system was modeled using a multi-physics finite element software tool. This FEM model calculates the conductive and convective heat transfers within the gearbox itself and between the gearbox and its surroundings. For the sake of simplicity, the gears were approximated by rotating discs. The discs were modeled in such a way as to sweep through the oil sump as they would do in a real gearbox. The vehicle to which the gearbox is attached is represented by a lump mass while air is allowed to flow around the assembly at specified velocity causing forced convection and therefore simulating the moving vehicle. The required inputs for the FEM model are obtained from the numerical model presented above and include the total dissipated heat from the teeth as well as the friction-induced heat from the bearings. Figure 5 shows the modeled FEM geometry and an example output of temperatures within a gearbox. This section shows example results obtained through the application of the model described above. All results are for oil A at the condition of 90% of maximum torque (800Nm). 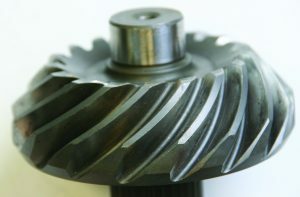 First, the EHL conditions in the gear contacts at specified conditions are shown, followed by magnitudes of individual losses in gear contacts, bearings, and those due to churning. The total losses and the relative contribution of each loss source are shown. 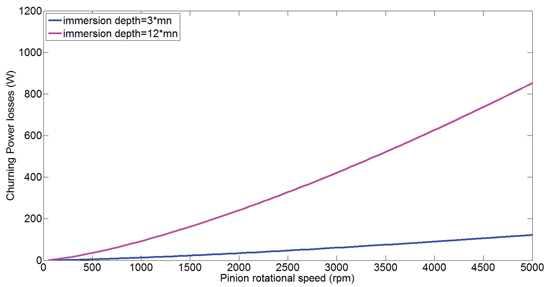 Finally, the model is used to compare the relative efficiency of the whole gearbox for the two selected oils. 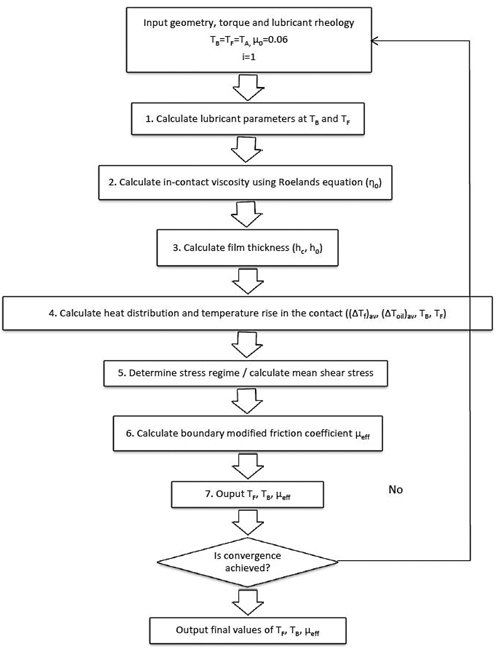 The predicted friction coefficients, minimum film thickness and the mean film temperatures along the path of contact for oil A and conditions specified in Table 2 are shown in Figure 6. Friction reaches a maximum value of 0.0593 at around 6 mm along the contact path and is minimized at the pitch point. It is also evident that the minimum film thickness remains almost constant throughout the contact. The temperature quickly rises as the slide roll ratio increases and is minimized at the pitch point as may be expected. Since it is assumed that the losses of the gear pair are predominantly in the form of dissipated heat, the calculation of the heat combined with the actual transmitted power can provide the efficiency of the gear pair in each step. 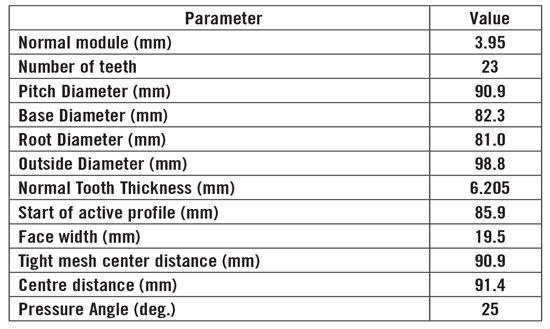 Figure 7 shows example of efficiency calculations along the tooth contact path for oil A at gearbox conditions listed in Table 2. As expected, the efficiency within the mesh cycle varies according to the slide roll ratio with the values in the overall range of 98-100%. Figure 8 shows how the churning losses vary with the rotational speed and the immersion depth of the gear. As expected, the larger the portion of the gear that is submerged the higher the churning losses are. It is evident that increasing speed also increases churning losses. The rate of increase in losses with speed depends strongly on the immersion depth itself. In the example of Figure 8, it is clear that the speed has a much bigger influence on losses for the bigger immersion depth of 12 mn. The churning losses for this particular application, which can be seen in Figure 4.4 were calculated for T = 70º C and immersion depth equal to 6 mn ,which is relatively shallow. Since the most important parameter for churning losses is the volume of the gear that is submerged in the oil, and since the gears in this application are relatively small, the churning losses are predictably only a small portion of the overall losses. The bearings that were selected for the application and the power loss that results from their rotation at maximum load and at the corresponding rotational speed are shown in Table 4. Note that single sealed bearings were chosen because these use the internal lubricant and are only sealed to prevent leakage to the outside of the shell. 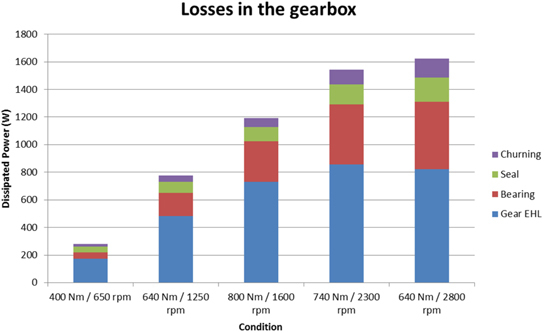 The combined losses in the gearbox across the power range of the engine can be seen in Figure 9. The calculations are carried out through a set of conditions corresponding to actual spots on the torque-power curve of the Diesel engine of the reference vehicle at roughly 80-90% of accelerator pedal input. It is evident that the EHL friction losses in the gear teeth contacts provide by far the largest contribution to overall losses. However, the relative magnitudes of each contribution differ for different operating speed and torque conditions. In particular, the power loss in bearings and those due to churning only become significant at high rotational speeds, although they are still smaller than losses in gear teeth contacts. The overall efficiency, including all additional losses for lubricant A under the specified conditions, is shown in Figure 5. 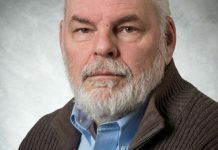 The values are in the range of 99-99.15% and broadly agree with the results of the experimental study of Petry-Johnson . Relative contributions of different loss sources shown here are also generally comparable to those shown in the same study. However, these previous results are not directly comparable to the current study because they were obtained on a temperature-controlled, jet-lubricated gearbox, which is significantly different than the current dip-lubricated application. 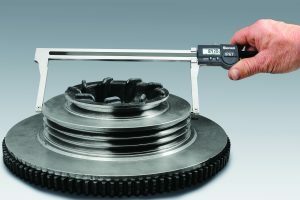 The described approach is capable of comparing different lubricants in terms of their effect on the overall efficiency of the gearbox. To illustrate this, the efficiency was calculated for the two lubricants described in Table 1, whose rheology was extensively characterized following the method described earlier. The model was run in the range of 650 – 2800 rpm and torque settings of 400 to 800 Nm corresponding to the particular automotive application chosen. 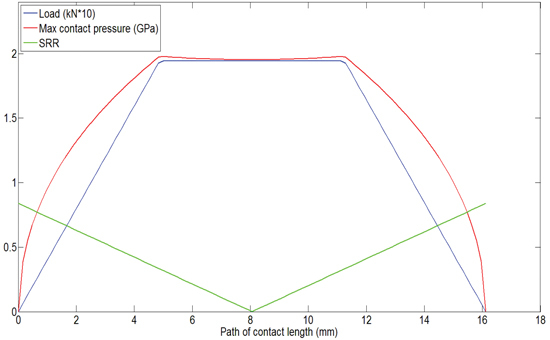 Figure 10 shows predicted gear friction power losses for the two lubricants under these test conditions. It should be noted that thermal coupling was not used when calculating the losses in this particular case. 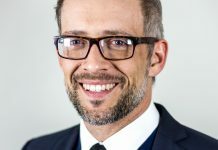 The results clearly show that the predicted gearbox efficiency for the two lubricants varies by about 1-2% depending on the operating conditions. These preliminary results are encouraging as they confirm that the devised methodology is able to differentiate between different lubricants in terms of their effect on transmission efficiency and that different lubricant rheology is indeed an important factor in the overall transmission efficiency. 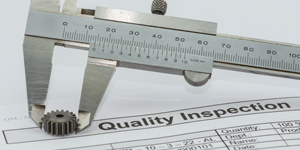 Therefore, the model will now be further refined and used to provide a more extensive set of results. 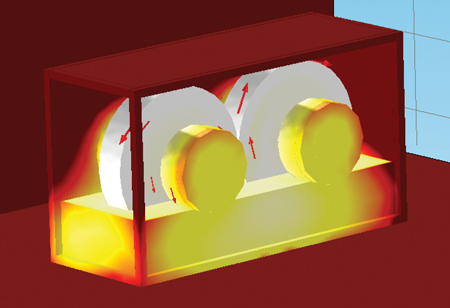 The model described above is able to calculate friction using an EHL algorithm and can predict the ambient temperature rise resulting from the heat loss in the contact. However, if the model is not thermally coupled, the accuracy of the method is suffering significantly because even though the contact temperatures are predicted using a feedback loop as illustrated earlier, the ambient temperature receives no thermal feedback from the code. 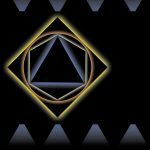 However, the addition of the multiphysics simulation addresses this drawback by adding the missing link of feedback. As soon as the temperature rise in the contact is calculated, it is fed back at the inlet of the model. This loop continues until the model reaches a state of thermal equilibrium where the heat that is generated in the contact is being dissipated away, resulting in zero temperature rise. The model converges relatively quickly due to its simple layout. 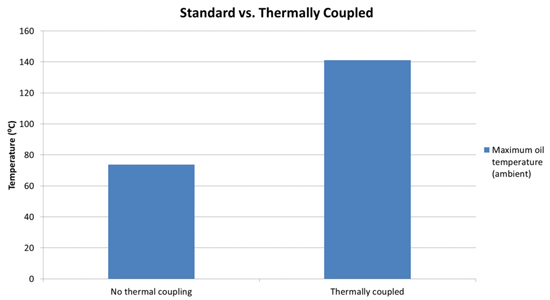 A comparison of the thermally coupled ambient temperature prediction and the non-thermally coupled prediction highlights the significance of the coupling as can be seen in Figure 11. The initial value of ambient temperature was 70º C in both cases and the simulated condition was that of 90% of maximum torque at 800 Nm and 1600 rpm. The temperature predicted using the thermally coupled model is almost double compared to the non- thermally coupled. This is expected as the EHL code on its own is essentially an “in-contact” code used to calculate thermal gradients and temperature rise within the contact while it lacks any information about the thermal parameters outside the contact such as the heat capacity of the assembly, the outside air flow, and the complex thermal network involved in the heat path. Past efficiency studies  omit the temperature rise of the oil sump and, instead, focus on efficiency and power loss, keeping the temperature controlled at a specific value via thermocouples. However, this may not be the case in real-life application, where there is a constant heat exchange between the gearbox and the environment. A simple thermally coupled one-stage gearbox has been simulated using an EHL model to calculate the friction within the teeth contact and the resulting frictional losses. 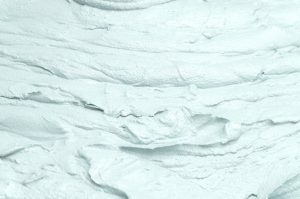 The present model was based upon viscoelastic rheology, according to the Eyring Maxwell theory and, crucially, uses well-defined lubricant characteristics obtained from extensive experimental tests. 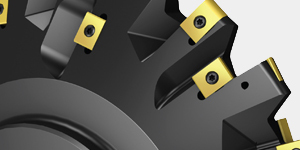 The EHL traction is calculated using a fast, iterative method. The model calculates the traction, the temperatures, and the film thickness within the contact as well as the ambient temperature rise. The model includes full thermal coupling by accounting for ambient temperature rise of the oil in the sump and the effect that this has on oil properties and, consequently on gear-teeth-contact friction. The ambient temperatures were calculated through the application of a multiphysics FEM simulation which considers all conductive and convective heat transfers in the gearbox. Bearing, seal, and churning losses are also considered. 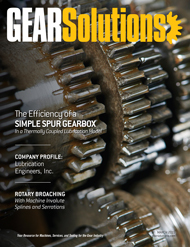 Preliminary results show that the efficiency of the gearbox is strongly dependent on the lubricant rheology as well as on the operating conditions. Changes in the lubricant composition can therefore provoke changes in the relative fuel economy of a vehicle. The high temperatures that have been predicted even for relatively mild operating conditions highlight the need for accurate lubricant data at such high temperatures. The current model has been successfully used to highlight the differences between two lubricants with similar formulation and slightly differing rheology. Work is underway to elucidate the effects of lubricant properties on the overall gearbox efficiency. 1. Baglione, M., Duty, M., Pannone, G., Vehicle system energy analysis methodology and tool for determining vehicle subsystem energy supply and demand, SAE Technical Paper 2007-01-0398, 2007, SP-2072, http://www.fueleconomy.gov/feg/atv.shtml. 2. Anderson, N.E., and Loewenthal, S.H., Spur-Gear Efficiency at Part and Full Load, NASA Technical Paper 1622, AVRADCOM, 1980. 3. Anderson, N.E., and Loss, P., Effect of Geometry and Operating Conditions on Spur Gear System, no. 80, 1981. 4. 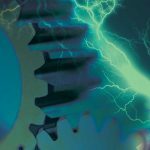 Li, S., and Kahraman, A., Prediction of Spur Gear Mechanical Power Losses Using a Transient Elastohydrodynamic Lubrication Model, Tribology Transactions, 53:4, 554-563, 2010. 5. Chang, L., and Jeng, Y.R., Modeling and Analysis of the Meshing Losses of Involute Spur Gears in High-Speed and High-Load Conditions, Transactions of the ASME, Journal of Tribology, Vol 135, 2013. 6. Höhn, B.-R., Michaelis, K., and Hinterstoißer, M., Optimization of Gearbox Efficiency, Gear Research Centre FZG, Technische Universität München, Germany, 2009. 7. Changenet, C., and Velex, P., A Model for the Prediction of Churning Losses in Geared Transmissions – Preliminary Results, Journal of Mechanical Design, 129(1), pp. 128–133, 2007. 8. Changenet,, C., and Velex, P., Housing Influence on Churning Losses in Geared Transmissions, Journal of Mechanical Design, Vol 130, pp. 128–133, 2008. 9. Long, H., Lord, A.A., Gethin, D.T., and Roylance, B.J., Operating temperatures of oil-lubricated medium-speed gears: numerical models and experimental results, Proceedings of the I MECHE part G: Journal of Aerospace Engineering, 217 (2). pp. 87-106, 2003. 10. Taburdagitan, M., and Akkok, M., Determination of surface temperature rise with thermo-elastic analysis of spur gears, WEAR 261 pp. 656-665, Elsevier B.V., 2006. 11. Changenet, C., Oviedo-Marlot, X., and Velex, P., Power Loss Predictions in Geared Transmissions Using Thermal Networks-Applications to a Six-Speed Manual Gearbox, Journal of Mechanical Design, vol. 128, no. 3, p. 618, 2006. 12. Olver, A.V., Testing transmission lubricants: the importance of thermal response, Proceedings of the Institution of Mechanical Engineers, Part G, Journal of Aerospace Engineering, 1991, 206(G1), 35-44. 13. Olver, A.V., and Spikes, H.A., Prediction of traction in elastohydrodynamic lubrication, Proceedings of the Institution of Mechanical Engineers, Part J: Journal of Engineering Tribology 1998 212: 321. 14. Petry-Johnson, T., Kahraman, A., Anderson, N.E., and Chase, D., An Experimental Investigation of Spur Gear Efficiency, Journal of Mechanical Design, DOI: 10.1115/1.2898876, 2008. 15. Kolekar, A., Olver, A.V., Sworski, A.E., and Lockwood, F.E., The efficiency of a hypoid axle – a thermally-coupled lubrication model, Tribology International, Volume 59, March 2013, pp 203–209. 16. 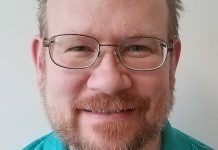 Chittenden, R.J., A Theoretical Analysis of the Isothermal Elastohydrodynamic Lubrication of Concentrated Contacts, Direction of lubricant entrainment, Proceedings of the Royal Society A: Mathematical, Physical and Engineering Sciences, 397, 271–294. 1985. 17. Evans, C.R., Johnson, K.L., The rheological properties of elastohydrodynamic lubricants, Proceedings of the Institution of Mechanical Engineers. C200, pp. 303-312, 1986. 18. Evans, C.R., Johnson, K.L., Regimes of traction in elastohydrodynamic lubrication, Proc. Institution of Mechanical Engineers, Part C, Journal of Mechanical Engineering Science, 1986, 200(C5), pp 313-324. 19. Muraki, et al., Influence of temperature rise on non-Newtonian behavior of fluids in EHD conditions, In Proceedings of the Fifth International Congress on tribology (Eds K. Holmberg and I. Nieminen), Espoo, Finland, 1989, Vol. 4, pp. 226-231. 20. Smeeth, M. Spikes, H.A., The influence of slide roll ratio on the film thickness of an EHD contact operating within the mixed lubrication regime, Presented at the Twenty-second Leeds-Lyon Symposium on Tribology, The Third Body Concept, Lyon, France, 5-8 September 1995. 21. 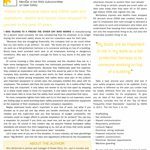 Eyring, H., Viscosity, Plasticity, and Diffusion as Examples of Absolute Reaction Rates, The Journal of Chemical Physics 4, 236. 22. Barus, C., Isothermals, Isopiestics and Isometrics in Relation to Viscosity, American Journal of Science, 3rd Ser. 45, pp. 87-96, (1893). 23. Roelands C.J., Correlational aspects of the viscosity-temperature-pressure relationship of lubricating oils, University of Delft, 1966. 24. LaFountain, A.R., Johnston, G.J., and Spikes H.A., The Elastohydrodynamic Traction of Synthetic Base Oil Blends, Tribology Transactions, 44, 648-656 (2001). 25. Hoffman, Dieter A., British Gear Association Teaching Pack, Module 4. 26. Hoffman, Dieter A., British Gear Association Teaching Pack, Module 3. 27. Changenet, C., and Velex, P., Housing Influence on Churning Losses in Geared Transmissions, Transactions of the ASME, Journal of Mechanical Design, Vol. 130, 062603-1, 2008.
is a PhD student in the Department of Mechanical Engineering and a member of Tribology group at Imperial College London. He obtained his Diploma in Mechanical Engineering and Aeronautics from the University of Patras, Greece in 2010. His research focuses on the efficiency of drivetrain components utilizing numerical simulation, finite element and experimental methods.